The picture shows seven schoolboys from Ashfold School in Handcross. They seem to be a loss to know what to get up to without their mobile phones! One boy seems to be creating something, though. The Large Version shows a view of the rear of the house with with what seems to be a small brick arbour at the far end of the building. 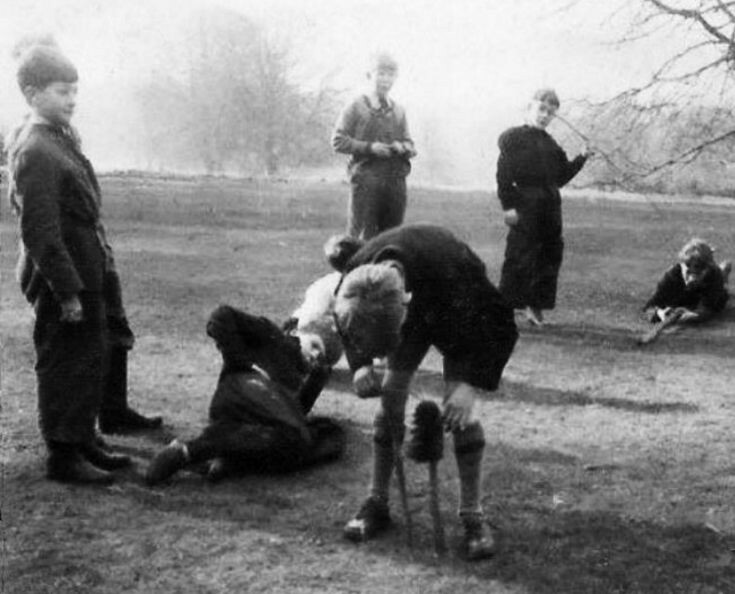 The school was founded in 1927 at Abinger Hill in Surrey. With the coming of the Second World War the school evacuated to Canada. Once peace had been restored the school returned in 1945 and set up temporary residence in Surrey. In 1946 the school took out a ten-year lease on Ashfold house. In 1956 the lease matured and the school moved to a historic building at a village near Aylesbury in Buckinghamshire, where they still operate. Select Open Document to view a newspaper cutting from 1956 announcing their departure from Handcross.